Are you in the mood to win something? I'm hoping so, because there's a copy of Journey to Death by Leigh Russell just waiting to live on your shelf. You can't win if you don't enter, so read the synopsis below, and then get to entering! 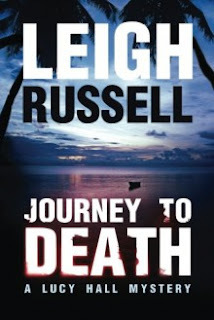 Lucy Hall arrives in the Seychelles determined to leave her worries behind. The tropical paradise looks sun-soaked and picture-perfect—but as Lucy soon discovers, appearances can be very deceptive. A deadly secret lurks in the island’s history, buried deep but not forgotten. And it is about to come to light. As black clouds begin to gather over what promised to be a relaxing family break, Lucy realizes that her father stands in the eye of the coming storm. A shadow from his past is threatening to destroy all that he holds dear—including the lives of his loved ones. A dark truth is about to explode into their lives, and that truth is going to hit them right between the eyes. If you're interested in what I thought, my review is here. Otherwise, enter to win below! U.S. mailing addresses only please. This giveaway ends on 3/29/16.